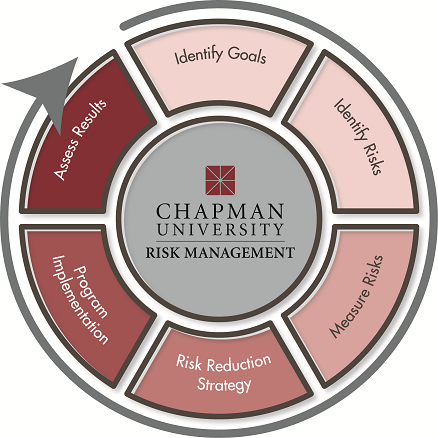 Environmental Health & Safety (EH&S) is an important component of the Chapman University Risk Management Department. Responsibilities include but are not limited to developing, implementing and maintaining University policies adhering to local, state and federal environmental health and safety regulations. EH&S works closely with the Chapman University Facilities Management and Campus Planning Department in the design and development of facilities, work areas and work procedures and makes environmental, health and safety recommendations accordingly. EH&S supports the needs of the University in Environmental Management, Industrial Hygiene, Laboratory Safety, Biological Safety, Radiation Safety, Emergency Management, and Occupational Health & Safety. Responsibilities include preparing, maintaining, and updating the University’s environmental policy and procedure manuals. EH&S and Chapman University Risk Management are responsible for keeping the Chapman University community updated on related environmental, health and safety regulations, and any changes to laws and regulations that impact the University. The Chapman University Environmental Health & Safety Manager is the University’s principal contact with all federal, state, and local regulatory bodies on related issues. Chapman University's EH&S Specialist assists the EH&S Manager and Risk Management Office, thus if questions or concerns arise and the EH&S Manager is unavailable, contact the EH&S Specialist. Karen Swift is the Chapman University Environmental Health & Safety (EH&S) Manager and Jennie Evangelista is Chapman University's EH&S Specialist. Karen may be reached by campus email or by phone at (714) 628-2888. Jennie may be reached by campus email or by phone at (714) 532-6023. To view the full range of Risk Management Resources, please go to our Risk Management website. Zika virus is spread to people through mosquito bites. The CDC has issued travel notices for people traveling to regions and certain countries where Zika virus transmissions is ongoing. If you are traveling internationally, the key areas impacted right now are identified by the CDC. Please use the link below to navigate to timely notices and alerts for this and other Risk Management and EH&S News.